In the world of modern computing, few things are as important as backing up, and few experiences are as jarring as realizing you've just lost a vast amount of work due to a hardware or software malfunction. But backing up can be time-consuming, and you may forget to do it. Even worse, you may set up an automated solution and find out at the moment of truth that it didn't work right--you thought your files were being backed up, but they weren't. With LazySave ($24, seven-day free trial), this will never happen. LazySave backs up your files and folders while the computer is idle. LazySave is built around a brilliant idea: Combine a screensaver with a backup application. As soon as you leave your computer unattended for a few moments, the screen goes blank and LazySave's backup dialog appears, constantly moving around to protect your screen while safeguarding your files. This way you always know it is running and what files are being backed up, but never have to think about it or remember to activate it. Unfortunately, LazySave's execution is not as brilliant. The application lacks an installer, and instead ships with a TXT file containing ten lines of instructions. That's all the technical documentation you're going to get. Configuration is accessed via Windows' Screen Saver Settings dialog. After configuring LazySave, I clicked the Preview button to see it in action. It ran well, but would not stop: Moving the mouse or tapping the keyboard did nothing to exit LazySave, and I ended up having to kill the process manually. This was apparently due to handling some large files in my backup set. LazySave's developer is aware of this issue and plans to fix it in the next release. 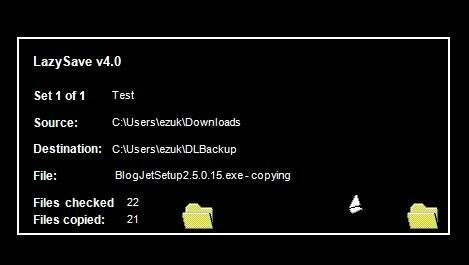 As for backup, LazySave can filter the file types it copies, but does not create compressed archives. It can create a new backup folder for each day, and delete backup folders older than a few days. Every daily folder contains all data, not just the changes. If you're backing up 100MB of material and keep seven daily folders, you'll be using up 700MB of disk space. You can also configure LazySave to copy files from multiple sources to multiple destinations across your system, and temporarily disable backup profiles. When it comes down to it, LazySave is too costly for what it provides. For a few dollars more, you could get a copy of Altaro's $37 Oops!Backup, a "time machine" clone for Windows which is significantly more robust, and just as automated.